www.massagetherapy.com—your resource for all things bodywork 13 When your phone or tablet is low on power, you immediately reach for the charging cord. But when a human being's batteries are depleted, they should take the opposite route and unplug instead. 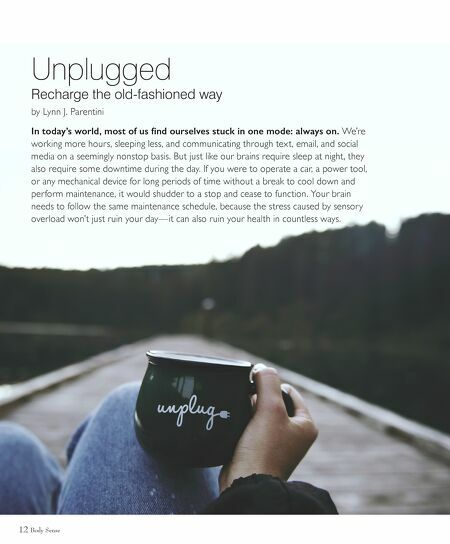 Unplugging means spending a few minutes disconnecting from everything— including your devices, your coworkers, your family, your duties, and your normal routine—in order to destress, decompress, and prepare for the rest of the day's tasks. These compact meditation sessions will help keep you healthy, happy, and alert, and they're easy to achieve if you follow a few simple guidelines. CHANGE THE SCENERY When we take time off from our jobs, we don't go to the office to do our lounging around; we do it on a sundrenched beach, a cruise ship, or some other place that's vastly different from our normal working environment. The same holds true for the mini-vacations your brain needs each day. In other words, if you've been balancing spreadsheets at your desk all morning, a few minutes spent browsing the internet at the same desk chair isn't much of a getaway. Instead, alter your surroundings completely by visiting a nearby park, strolling beside a river or through a garden, or just setting up a "rehabilitation chair" under a tree. Seek out natural light and fresh air and, if possible, avoid any manmade noises. Babbling brooks and birdsongs are a plus, as science suggests that nature sounds have a calming, restorative effect on our psyches. And while a brisk jog or a hike through the woods has its benefits, strenuous activities like these aren't the best choices during unplugging because your brain will be hard at work navigating the terrain instead of just kicking back and relaxing like it should. TAKE YOURSELF OFF THE GRID Unplugging is like taking a waking nap, and all the things that bother you when you're trying to sleep will bother you during your unplugging session too. In order to properly recharge, put away your phone and all other devices. Even when you're not talking or texting, simply having a phone nearby can be like standing in a room full of people due to the constant stream of emails, posts, tweets, shares, and likes. And speaking of people, be sure to avoid them during this time; unplugging is a solitary activity, and your brain—specifically your prefrontal cortex—needs a break from both conversation and multitasking to lower your anxiety levels and boost your ability to think clearly, logically, and rationally. The act of unplugging doesn't need to be complex or extravagant. Depending on your location and the time of day, good choices include doing a few minutes of light stretching; taking a bath or shower in dim lighting or by candlelight; sinking down in your comfiest chair with a cup of herbal tea, a glass of sparkling water or juice, or another nonstimulating beverage; sprawling beneath a tree and enjoying the show nature puts on; or lighting a scented candle or a stick of incense and lying on a sofa or yoga mat for a few minutes of sweet-smelling stillness. DON'T PENCIL IT IN; USE A PERMANENT MARKER Many of us feel we should only take a break once we've finished our work, treating the downtime like a reward. But then the work takes longer because we're overstressed, leaving us without any time to unplug and refresh. We end up working more hours than usual and need that break more than ever, but don't allow ourselves to take it for fear of falling even further behind. The truth is, working longer hours doesn't always produce better results. Studies have shown that taking short breaks during the workday not only improves focus and rebuilds energy, but also increases productivity. That means downtime should be a regularly scheduled part of your routine, just like your other important tasks. By adding this crucial element to your daily calendar, you'll be able to face every duty, project, or challenge with a smile and a full battery. Lynn J. Parentini is an author, speaker, and creative strategist for the wellness, skin, and spa industry. www.massagetherapy.com—your resource for all things bodywork 13 Did You Know? On average, users check their phones 47 times each day and spend a combined total of 4 hours staring at the screen.